My go-to recipe is a basic chocolate cookie... this time I went to town with the decorations (thanks for the inspiration from the latest cake decorating weekly magazine that is being promoted in NZ at present). Now, before I had children I had a naive image of what parenthood would be like - me doing crafts with my children... spending time decorating biscuits and cakes... little did I know that I had zero tolerance and even less patience. I soon discovered that cake decorating was not my forte (around about the time of Dylan's first birthday, although I did try again somewhere around Nadia's first birthday), and after tears and swearing - decided that a basic iced cake was the most the kids could ever expect, and I've been training them ever since to have low "cake expectations". Every now and then - I think, hmm, maybe I could manage that? Now these cows aren't rocket science in the decorating world - chocolate buttercream icing, jellybeans, chocolate melts, marshmallows and chocolate drops. I figured I could do these... and they turned out not too bad. In my spare moments I've been reading - recently downloading the first book in David Edding's series The Belgariad. I purchased these books for my brother as they were published back in the 1980's?? ?, probably reading them several times in my teenage years; and haven't read them since. The first few pages were like curling up with an old friend... comfortable like a pair of old slippers. I'm really enjoying the repeat performance. Sorry no sewing this time... maybe next week? A small amount of regular sewing time during the week has produced a finished quilt top! Woohoo!! There's a square in there, finished size 75" x 75"
Unfortunately this will now be added to the "ready to quilt at a later date" pile, but, I am really happy to have spent the time getting this one done - sometimes you just need some mindless sewing, and I was super happy with the way this pattern enhanced the Eiko fabric bundle. Saturday was my August stitching with the girls day... other committments meant it was just me and Charlotte this time, but we always have heaps to catch up on :o). Luckily our combined kids are close enough in age that they play together *mostly* wonderfully, as long as there are ample baking supplies! I decided to knuckle down and get something achieved on the Tillies Lane BOM. My stack of hourglass type blocks has grown slowly and erratically, and I knew that I just had to move onto another stage, if the project was ever going to achieve any momentum. So Block One of the central panel was created. This is my latest scrap project, so everything except for the background cream on creams, is leftovers from other projects. My next focus project is getting the Bluebirds and Berries quilt quilted. First things first, deciding on the backing and getting it basted. I knew I had extra backing fabric set aside for my huge applique quilt (all ready for the day it is finally finished), so to work out what the excess was (and whether there was enough for the B&B quilt) - I had to lay it all out. It's been a while since this one has been out of the bag... enjoy the eye candy! I started this quilt over 5yrs ago when we were in the initial stages of buying our house. It was so stressful, and my husband suggested going to Paihia to "destress" at my then LQS (which has since unfortunately closed down) while he took the kids for very big ice-creams. I took along the magazine that had the pattern for this quilt, and bought all the bits and pieces I needed. 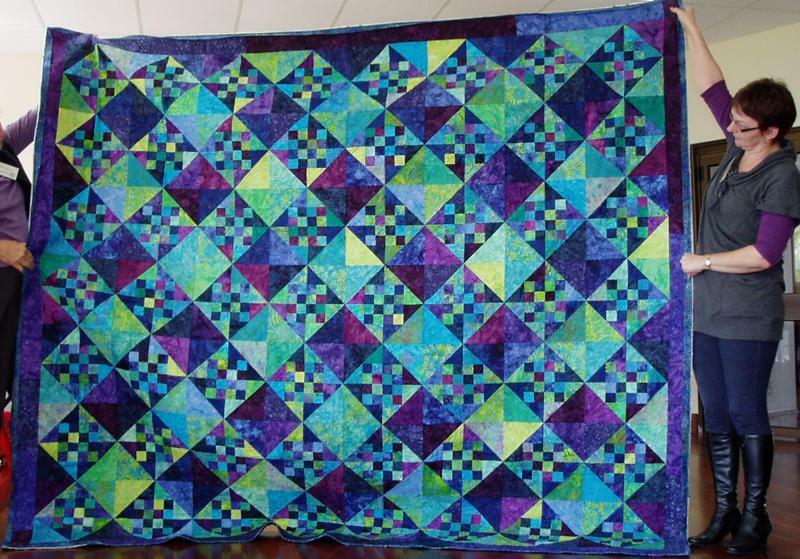 After completing the construction of the quilt per the pattern, I worked out it was a touch small to fit on the bed comfortably, so designed and added the corner sections, to make the whole thing bigger. Both the decision to make it bigger, as well as deciding to hand blanket stitch around the applique, turned this project into a mammoth task. I still have quite a bit of the blanket stitch to do, and one day I will get serious again, and get this finished. So that's me all caught up for the week, what have you been up to?